For those of you not in the know, I have anxiety issues. However, after today, I no longer see it as anxiety, I see it as forewarning. A sixth sense that has kept me and my family from mortal injury. Take the red truck. It scared me to death. I screeched through two red lights before my warnings were heeded. They fixed the brakes and asked for my approval. Smart men. I drove a very small amount and said-“Nope! Brakes still scare me.” At that point they thought I was nuts until they encountered a braking problem of their own. The brakes are now fixed. So tonight, I apprehensively drove the white truck to town to watch a movie because we were going to get some concrete. I told myself I was overreacting and that I had to get used to the vehicle (I don’t like it because it has WAY too much play in the steering for my comfort.) It started to rain, annoying us that we wasted precious gas and time when we could have just driven the car, for we could no longer haul bags of concrete in the rain in the back of a truck. We therefore went to the movie and enjoyed ourselves thoroughly. This…discussion…continued all the way to our mailbox. We called dad to ensure he knew of the problem ahead of time and to call us in 30 minutes to make sure we were going well still. We called again when we hit our road. We pulled up to the mailbox and heard TICATICATICA SNAP!! BING WHEEEEEEEEEEEEEE! We walked over to the other side of the road and called dad who came down the drive to pick us up. (For those not in the know, our driveway is half a mile long. We have no lights either. That’s great, but we also have mountain lions, bears, coyotes, and wild boars.) It was way too dark to walk without a flashlight. We stayed in the light of the neighbor’s house waiting until we felt safe enough to return to the vehicle. We rolled the windows up, got everything needed out, and waited for dad. He started the truck, Arlis saw flames at the alternator, and dad shut it off quicker than I’ve ever seen him do anything. They push it out of the way, we drive home in dad’s truck, thanking God constantly for our protection from harm and perfect timing. I have recently discovered that getting published has very little to do with your writing talent and skills. It’s like any job really. They lie and tell you they’ll work around your schedule. You lie and double the years of experience you have. Or in the case of acting, the headshot gets the audition, the resume is half false, your measurements and weight are inaccurate enough to get you arrested, and they promise you the moon and stars. The truth of it is, it’s how you answer the questions in the interview/audition, how you represent yourself, your amount of confidence, and how much puckering you do to their bending. Most of the applicants and actors are perfectly fine for the job, most of them better than the winner, in fact. Sad, but true. Now, getting published. You have to have a good story, just like you have to be able to do the job from above, and be talented as an actor. Most people can perform the job, most people are good actors, and everyone’s got at least one good publishable work in them, but it’s those that make themselves stand out that actually get published. It’s those that write a blog, have a web page, and write an excellent query letter. This does not take into account the celebrities, editors, and other exceptions. I just finished printing out all of my personalized rejection letters. Why? So I can see how to change my QUERY, not my book, my query letter. Because that’s what does it. I am reading article after article from Writer’s Digest on getting published, etc, and I have found that most of them are how to write a query letter or a submission or synopsis, etc, NOT what to do about your work. Weird. BUT, at least I am to that point now. I’m getting personalized rejection letters, printing them out, and trying to perfect my interview. I had no idea this was part of the writing process. I also had no idea that marketing was as large of a concern for the writer as it is. I’ve seed publishers put flat out on their criteria that they require a new author to be available for travel and marketing and all sorts of things. Exciting, but crazy. Another thing to keep in mind is that you need to know your category. This also has to do with marketing as your category is a predetermined niche with predetermined specifics of getting sold. I wrote what I believed to be a picture book. It was too many words to their requirements. I can easily name ten picture books off hand in any library that defy these requirements rampantly, but they have one difference. They have a pre-published author, celebrity, or one of the other exceptions mentioned earlier. So, I had to find the niche. Instead of a series of picture books, I am going to have to combine all of them together and make a chapter book. After that, I’ll have to ensure it’s age appropriate. For although a chapter book is for a certain age group, picture books are for a certain age AND for those read by their parents. Needless to say, writing is a VERY small part of writing. I write this for two reasons. One, I haven’t been blogging as I should, and this was sitting in the draft pile. And two, to help those who might be in a similar situation and want to know what to do, what to ACTUALLY do, not what all those articles that they will inevitable read and study tell you to do. I wish those all the luck in the world-good writing and enjoy your art! 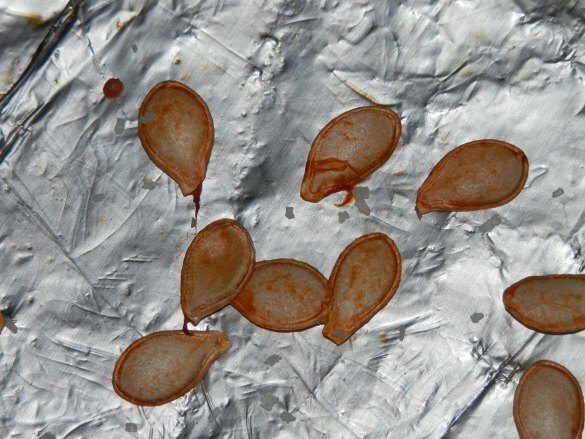 Most people are familiar with pumpkin seeds, although I dare say if you’ve only had store bought, you’ve never really had them. 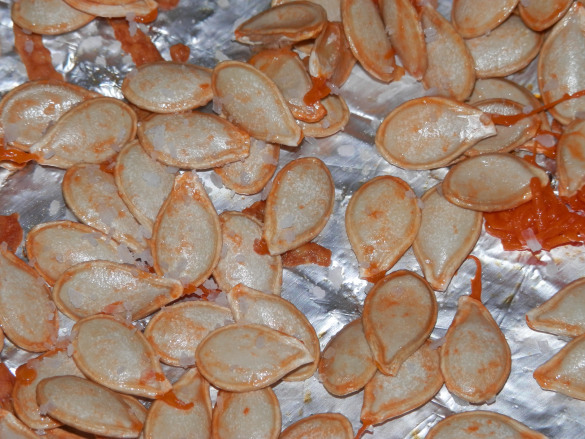 Roasting squash seeds isn’t difficult (my way), is very tasty, and makes a glorious smell in the house. You will need one squash, and Kosher salt. 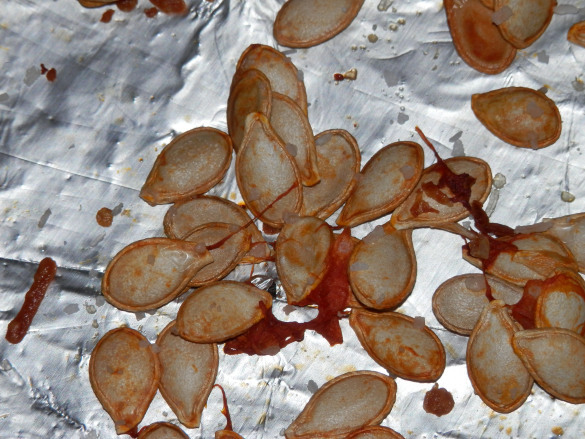 Scrape all the pumpkin puke out of your pumpkin. 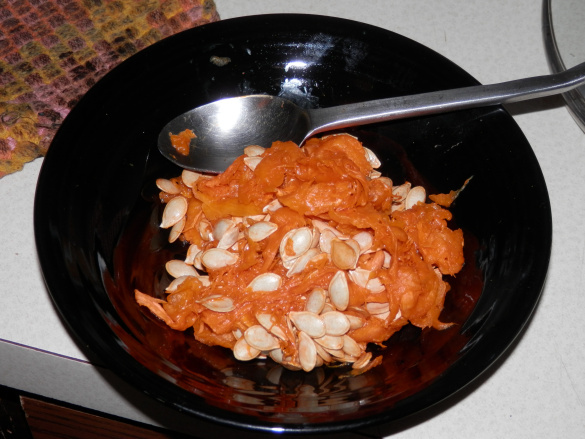 I used a butternut squash, and this is what I got. 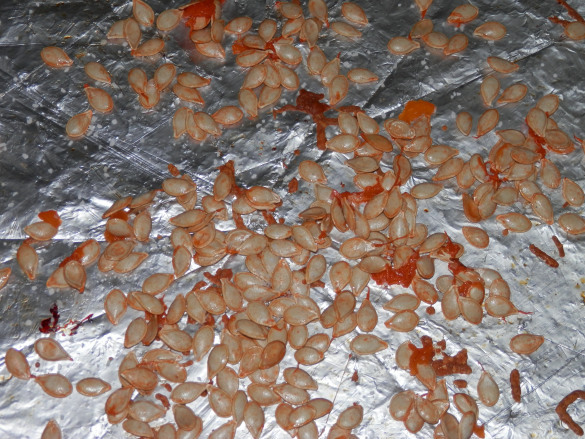 Now, get your hands all nasty and separate the seeds from the pulp. Do NOT wash them. When I saw in instructions to wash these seeds I was absolutely aghast. Where’s the flavor? Then they add a bunch of stuff to give it flavor-nope, leave them be. You will want to remove the vast majority of the pulp, but don’t wash them. Spread them out on a cookie sheet. As you can see, there’s a bit of pulp, but not much. Sprinkle with Kosher salt. With these pictures, it’s kind of hard to tell that they’re done, but they are. The masses of pulp stay on the pan pretty much. I don’t store mine as they’re gone in a few minutes, but you can store them in a zippie bag if you need to on a shelf. Yum!